Random House Books for Young Readers, 9780553536102, 320pp. From the bestselling author of Escape from Mr. Lemoncello’s Library and coauthor with James Patterson of I Funny, House of Robots, and Treasure Hunters, comes the second hilarious, fun-in-the-sun adventure in his illustrated series about all the wacky things that happen when you live in a motel! There’s always something wacky happening when you live in a motel, and P.T. (named after P. T. Barnum, of course) has grown up at the world’s wackiest! When word gets out that the hottest teen idols in Hollywood (plus current YouTube sensation Kevin the Monkey!) 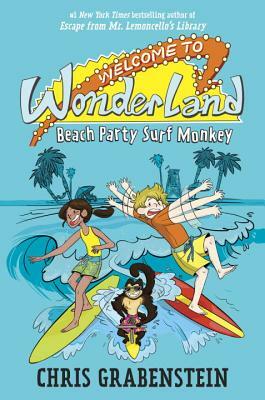 will be filming their next movie—Beach Party Surf Monkey—right in St. Pete’s Beach, Florida, P.T. and his friend Gloria know that the Wonderland would be the perfect location. Now they just have to convince the producers! But when things start to go wrong (crazed fans? missing stars? ), it will take all of Gloria’s business genius and P.T.’s wild stories to save the movie before both it and the Wonderland are all washed up! Chris Grabenstein is the author of the New York Times bestsellers Escape from Mr. Lemoncello’s Library, Mr. Lemoncello’s Library Olympics, and The Island of Dr. Libris and has coauthored numerous bestselling books with James Patterson, including the I Funny, House of Robots, and Treasure Hunters series and Jacky Ha-Ha. Chris grew up going to St. Petersburg, Florida, every summer and loved visiting roadside attractions like Gatorland, the fabulous Tiki Gardens, Weeki Wachee Springs, and the “talking mermaids” at Webb’s City. You can visit Chris at chrisgrabenstein.com.